Oh man, I wanted to love everything about this band and album. 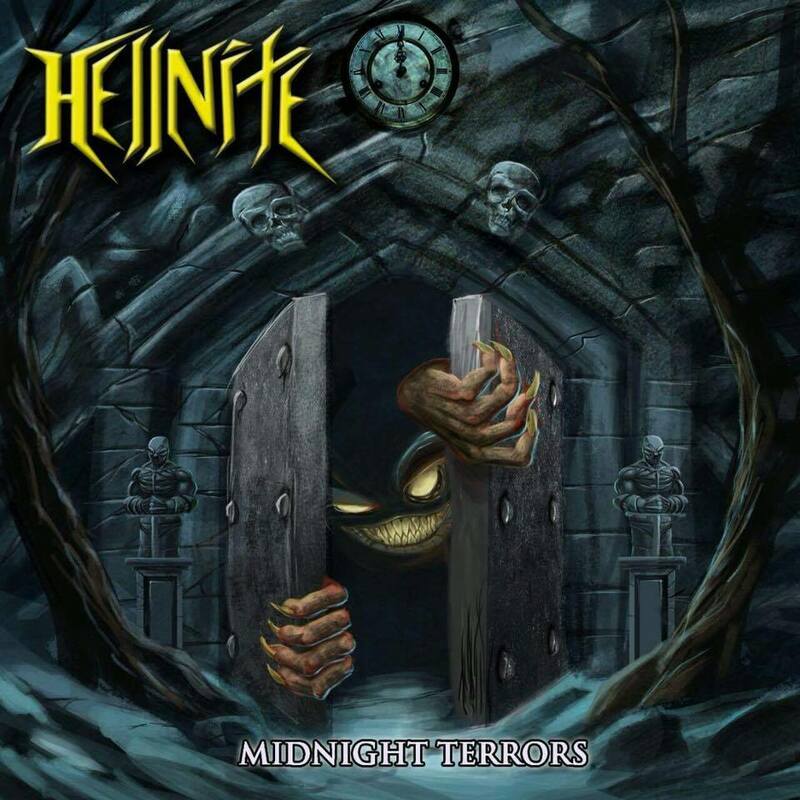 Hellnite is a wonderfully cheesy moniker; they’re from the Americas; the angular logo suggests they play thrash metal (my number 1 passion in life), and they have song titles like “Phantom Force” and “Thrash Of The Living Dead”. So far, it all points to a rippin’ good time something in the vein of Merciless Death or Fueled By Fire. On Sliptrick Records’ website, the Mexicans list their influences as Kreator (which I totally get) and… Alestorm (which makes me question both their musical integrity and their sanity). Alas, what’s actually on offer on their debut full-length is more akin to a gruffer version of Iron Maiden with the occasional Flotsam & Jetsam-esque riff and the worst vocals this side of Dave Mustaine’s onstage voice. The most disappointing aspect of Midnight Terrors is that there is a really good songwriting prowess being hidden under mounds of directionless structuring. Sure, the production quality isn’t anything to write home about. Drums are way too far back in the mix and sound strangely processed, guitars don’t have as much edge as the sub-genre requires, and the vocals are…well, I’ll get to them later… Rather refreshingly, the bass is always audible and gets some lovely stand-out licks, especially in “Spirits Prevail”. However, despite the dodgy mix, Hellnite provide moments of genuine headbang-worthy fun here and there. Creative riffs like the middle section of “Thrash Of The Living Dead” or galloping rhythms like opener “Phantom Force” will have any thrash fan nodding in approval. Unfortunately, there are some odd decisions being made along the way. Every once in a while, a lead guitar will jut out above the clamour and emit a bizarre sequence of notes which barely comprise a ‘tune’. It’s jarring and has me frowning more than admiring. Also, the acoustic sections – which I’m used to hearing in the more progressively tinged thrash acts – have the same dissociating effect. “Darker Than Black” is guilty of this, despite being an overall glitzy, frenetic bag o’ riffs. Oh, and the sparing use of keyboards is questionable too. I admire the trio’s balls in attempting atmospheric layers, but the execution leaves a lot to be desired. Speaking of “Darker Than Black”, it’s probably the absolute highlight of the record thanks to some seriously fancy fretwork from both bass and guitar, and some flat-out awesome fills from Ryan behind the kit. The main reason this track is a success? Instrumental. No vocals. This entry was posted in Bands, Heavy Metal, Reviews, Thrash Metal and tagged 2019, 4/10, Alestorm, CD, Dave Mustaine, Flotsam & Jetsam, Fueled By Fire, Heavy Metal, Hellnite, iron maiden, Kreator, LP, merciless death, Mexican thrash metal, Mexico, mexico city, Midnight Terrors, sliptrick records, South America, Thrash Metal.